Chromatin immunoprecipitation followed by genome tiling array hybridization (ChIP-chip) is a powerful approach to identify transcription factor binding sites (TFBSs) in target genomes. When multiple related ChIP-chip datasets are available, analyzing them jointly allows one to borrow information across datasets to improve peak detection. This is particularly useful for analyzing noisy datasets. (Joint Analysis of Multiple IP Experiments) to perform the joint analysis. The genome is assumed to consist of background and potential binding regions (PBRs). PBRs have context-dependent probabilities to become bona fide binding sites in individual datasets. This model captures the correlation among datasets, which provides basis for sharing information across experiments. Real data tests illustrate the advantage of JAMIE over a strategy that analyzes individual datasets separately. ChIP-chip is a powerful approach to study protein-DNA interactions. With rapid growth of ChIP-chip data in public repositories such as Gene Expression Omnibus (Barrett et al. 2009), it becomes more and more common that multiple datasets related to the same TF, pathway or biological system are collected. When multiple such datasets are available, it is often desirable to analyze them jointly. The motivation of this project can be illustrated in below Figure 1, which shows four related ChIP-chip experiments (GEO access numbers GSE11062 and GSE17682) performed by two different labs using Affymetrix Mouse Promoter 1.0R arrays. The first experiment has low signal-to-noise ratio due to technological and biological reasons. A careful examination of the data shows that peaks in these four datasets are correlated. The peaks from different datasets tend to occur at the same locations in the genome. This correlation can be potentially used to improve statistical inference. For example, the weak peak highlighted by the solid box in the first dataset in Figure 1(a) cannot be easily distinguished from background noise if one looks at this dataset alone. However, if all datasets are analyzed together, the observation that all other datasets have strong peaks at the same location suggests that the weak peak in the first dataset is a real binding site. By contrast, the peak highlighted by the dashed box has approximately the same magnitude in the first dataset, but no binding signal has been observed in the other datasets, suggesting that it is less likely to be a real binding signal. When multiple datasets are analyzed jointly, it is also important to keep in mind that some TFB are condition-specific. For example, the genomic location shown in Figure 1(b) has strong binding signal only in the second dataset. In this case, even without referring to the other datasets, the enrichment is strong enough and should be called a peak. In this case, we should also avoid claiming that other datasets have peaks at this region only because there is a strong peak in the second dataset. Ideally, there should be a mechanism that automatically integrates and weighs different pieces of information, then ranks peaks according to the combined evidence. Figure 1: Motivation of JAMIE. 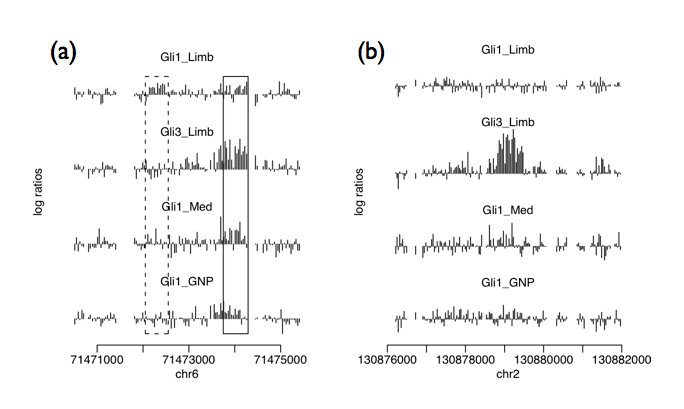 (a) Four Gli ChIP-chip datasets show cooccurrence of binding sites at the same genomic locus. This correlation may help distinguish real and false TFBSs. Each bar in the plot corresponds to a probe. Height of the bar is the log2 ratio between IP and control intensities. (b) An example that shows context dependency of TF-DNA binding. To capture the locational correlation among datasets, we introduced the concept of potential binding region (PBR), which is defined as a genomic region can potentially be bound by some TFs. We further assumed that the active binding event for a dataset depends on condition such as cellular context, but they can only happen at the PBRs. Based on these assumptions, we proposed a hierarchical model, as illustrated in Figure 2, to jointly model data from multiple chip-chips. Assume the genome is split into non-overlapping window of a certain length, such as 1000 bps. At the top level we assumed that a priori, a window can become a PBR with probability π, or become background with probability 1-π. We define Bi to be the indicator for the ith window being PBR or not. At the next level, if a window is a PBR, in dataset d, we assume it can either become an active binding site with probability qd, or remain silent with probability 1-qd. Aid is defined to indicate the active binding event for window i in dataset d. We assume that conditional on Bi=1, Aid's are independent, or the active binding events are independent among datasets at PBRs. 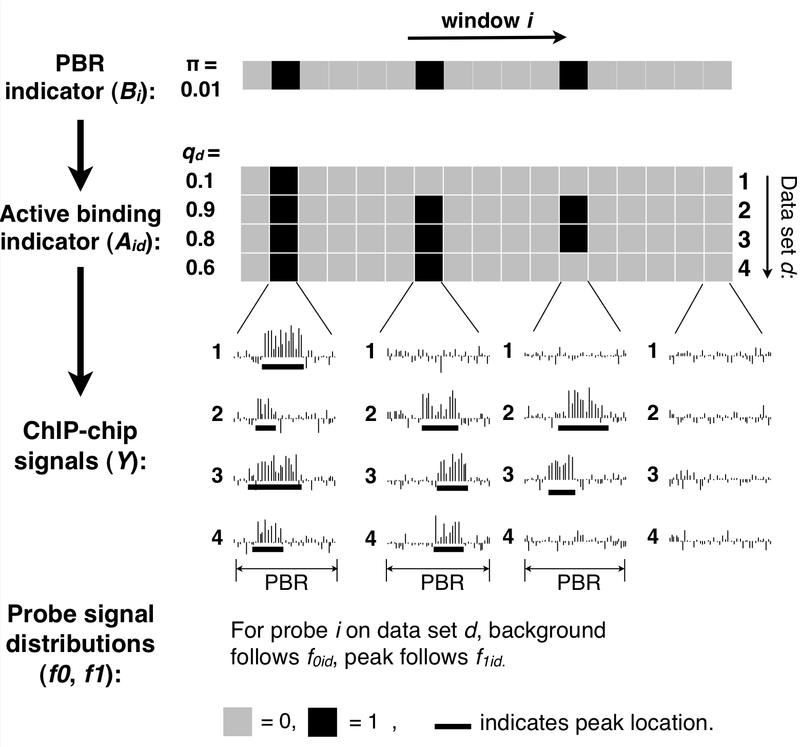 At the next level, the chip-chip signals, as denoted by Y, are generated according to the active binding status in each dataset. If there is no active binding, the probe signals are from background distribution. If there is active binding, there will be a peak in the region. But instead of forcing the peak to occupy the whole region, we assumed that the peak can be of any length and at any relative location within the PBR. This assumption allows much flexibility because some TFs bind at the same gene promoter but recognize different DNA motifs, so their peaks don't exactly overlap. Finally, we assume the probe signals follow two different distributions, f0 for backgrounds and f1 for peaks. In this model, we observed Y, the probe signals. Bi and Aid are missing indicators. Model parameters are π, qd's, and probe distributions f0 and f1. Figure 2: Illustration of JAMIE hierarchical model. Based on the model, the joint likelihood of the observed and missing data can be derived and the parameters are estimated via EM algorithm (Dempster et al 1977). We then scan the genome by the joint model and compute the posterior probabilities of each probe starting a peak. The peaks then can be detected and ranked from these posterior probabilities. JAMIE was implemented as an R package. The engine functions were written in C for better performance. It takes CEL and BPMAP files (for Affymetrix tiling arrays) or a single text file (all other platforms) for raw intensities, and a text configuration file. In two lines of R code, JAMIE will output a list of peaks ranked by their posterior probabilities for each dataset. JAMIE provides reasonable performance although the computation is much more intensive compared to some other ChIP-chip peak detection software such as TileMap (Ji et al. 2005) or MAT (Johnson et al. 2006). In a test run with four datasets, each with 3 IP, 3 control and 3.8 millions probes, the whole analysis took around 15 minutes on a PC running Linux with 2.2GHz CPU and 4G RAM. Barrett, T., Troup, D.B., Wilhite, S.E., et al. (2009) NCBI GEO: archive for high-throughput functional genomic data, Nucleic Acids Res, 37(Database issue), D5-15. Dempster, A.P., Laird, N.M. and Rubin, D.B. (1977) Maximum likelihood from incomplete data via the EM algorithm, J Roy Stat Soc B, 39, 1-38. Ji, H. and Wong, W.H. (2005) TileMap: create chromosomal map of tiling array hybridizations, Bioinformatics, 21, 3629-3636. Johnson, W.E., Li, W., Meyer, C.A. et al. (2006) Model-based analysis of tiling-arrays for ChIP-chip, Proc Natl Acad Sci USA, 103, 12547-12462. Wu H. and Ji H. (2010) JAMIE: Joint analysis of multiple ChIP-chip experiments. Bioinformatics. In press.